Vanda is a genus in the Orchid family. There are about 80 species, and the genus is commonly cultivated for the marketplace. 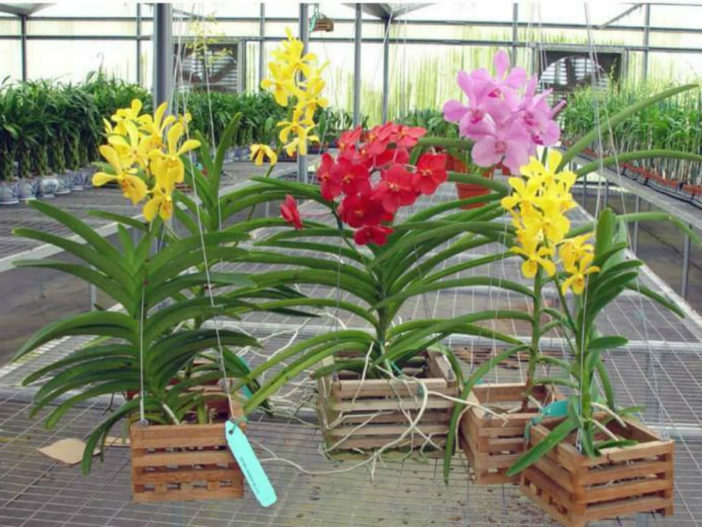 Vanda orchids are tropical plants that do well in a warm, humid environment. The flowers are up to 6 inches (15 cm) in diameter when they are in bloom and they come in a variety of colors. Vandas can flower at any time of year. The heaviest flowering season is between spring and fall. Growing Vanda orchids is easier than it might seem, but you will need to pot your orchids with the right type of growing medium, provide them with the ideal environment and tend them carefully for best results. Vandas are grown in teak baskets or in pots. For most household conditions, pots are best because they hold more moisture around the roots. Plants in pots should be watered just as the medium dries out, approximately every 5 to 7 days for larger clay pots. It is best to use rain, distilled or reverse osmosis water. Most Vandas grow on treetops on ridges along rivers and prefer bright light. When growing indoors a south window exposure is best. Vandas can be grown outside in the summer (or all year long depending on where you live) as long as the night temperatures are 50 °F (10 °C) or above. Grow under dappled sunlight such as a shade tree or an evergreen. Gradually they can be exposed to brighter light. Vandas require warm temperatures . Daytime temperatures between 70 and 90 °F (21 and 32 °C) are ideal, with night temperatures of 60 °F (16 °C). If provided enough humidity, Vandas can be grown without any potting medium whatsoever. Many times they will be shipped from overseas where they have been grown in high humidity environments, therefore being grown bare root in the basket. The ideal household does not provide enough humidity to keep Vandas growing well in bare root condition.